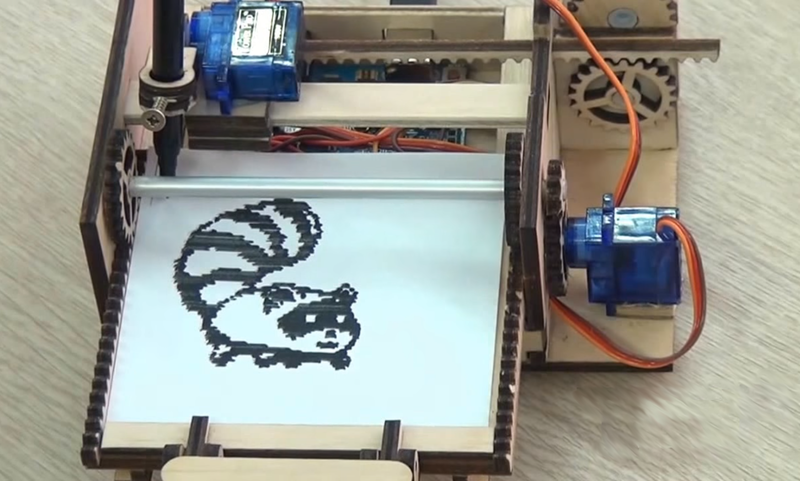 This little DIY 64×64 graphical printer by [Egor] is part pen plotter in design, somewhat dot matrix-ish in operation, and cleverly designed to use unmodified 9G servos. The project page is all in Russian (translation to English here) but has plenty of photos that make the operation and design clear. Although nearly the entire thing is made from laser-cut wood, [Egor] says that a laser cutter is optional equipment. The first version was entirely cut with hand tools. Small DIY CNC machines driven over a serial line commonly use Arduinos and CD-ROM drive guts (like this Foam Cutter or this Laser Paper Cutter) but this build uses its own custom rack-and-pinion system, and has some great little added details like the spring-loaded clip to hold paper onto the print pad. The frame and parts (including all gears) are laser-cut from 4 mm plywood and the unit is driven by three small servos. A simple Java program processes images and an Arduino UNO handles the low-level control. A video of everything in action is embedded below. Speaking of rack-and-pinion setups using cheap servos, that idea was taken to the next level by this design for a 3-D printed linear actuator that uses unmodified servos. It is a great project, so I’m not going to say anything about the dot-matrix raster algorithm! Yes, but you must account for the backlash in the overall system to make sure that the odd and even lines line up with each other. Also, any unevenness in the gears can make parts of the image not line up correctly when scanning in opposing directions. I also noticed the inefficiency of always starting to scan from the left edge (rather than starting from the first black pixel). At first, i thought there might be some kind of end-stop detector to help improve the alignment. But this does not seem to be the case. Does anyone know of a way to translate the Russian music in the video into English?! Is its Java sketch not available?